As in, why are some Browns fans so dysfunctional? As in, why does it matter what Jim Brown thinks about the team? As the Browns were wrapping up the last Organized Team Activity before training camp, team president Mike Holmgren gave a relatively benign press conference last week. Overall, Holmgren didn’t say much, but he did leave fans with two takeaways: one, he would try to be more accessible with the media as long they as didn’t cause shenanigans and, two, the Browns will actually wear their Brown jerseys next season. Easy enough, thanks, and we’ll see everyone at the end of July. And then someone had to bring up the franchise’s strained relationship with Jim Brown. That’s all the anti-Holmgren crowd had to hear to get their Orange-and-Brown knickers in a twist. 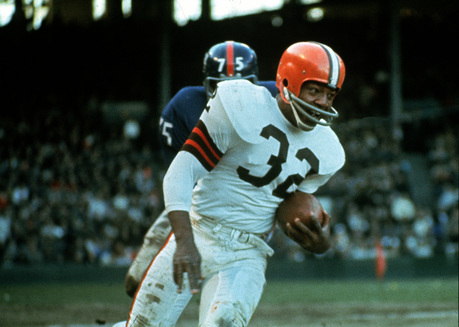 Surely Holmgren and the Browns must be up to no good because Jim Brown is the greatest running back in NFL history. What he’s not, however, is a member of the front office who should have any say in how the team is run or which players the team drafts. Brown’s criticism of Holmgren and owner Randy Lerner is so transparent it’s laughable. Once Holmgren relieved Brown of his duties as an official executive adviser, and the six-figure payday that came along with it, all of a sudden Brown had a problem with the team. Suddenly, Lerner was in England too much. Somehow, Trent Richardson, the consensus No. 1 running back in the draft is just ordinary. Interestingly enough, Brown didn’t have a problem with Lerner when he was an advisor. Nor do we ever remember hearing him criticize the team’s draft picks (although it would have been justified with some of the picks made by Phil Savage and Eric Mangini) when Brown was drawing a paycheck from the team. Funny how it works out that way. (And it’s funny how the people who agree with Brown on Lerner don’t actually want Lerner involved with the daily operation of the team, so they can’t even figure out what it is they are supposed to be mad about). It’s not as if the Browns don’t want Brown around; they just don’t want him involved in day-to-day decisions. A Hesh taught us on The Sopranos, when someone new takes over, they get to call the tune. It’s then up to everyone to decide if they want to go along or not. Holmgren is under no obligation to keep Brown in an ill-defined role with the team just as Brown is well within his rights to walk away if he doesn’t like the way his role is being redefined. But it is really time to let this go. As in, why do the Browns “have” to do something with Colt McCoy? Training camp doesn’t start until July 29. The regular season doesn’t begin until Sept. 9. So why are so many people in a rush for the Browns to make a decision on the back-up quarterback position? We think the Browns should keep McCoy as the backup to Brandon Weeden. McCoy is younger than Seneca Wallace and has a bigger upside (which may not be saying much, but still). Entering his 10th year in the league, Wallace is not going to get better. That doesn’t mean he’s going to regress in the next couple of months, but at this stage of his career he is what he is. I think if I’m Andy Reid or Mike McCarthy, I’m calling Cleveland GM Tom Heckert and sending a 2013 sixth-rounder to Cleveland for McCoy. Perfect backup quarterback who, in time, might be good enough to start for your team for multiple seasons. Take out the tape of his game at Pittsburgh last season, before he got blasted by James Harrison, and tell me he doesn’t have the poise, decision-making and presence to have a chance to be a good player. Well, here’s the thing: if it turns out that other teams actually want McCoy, then why wouldn’t the Browns want him? (And King goes on to make that point as well). It’s not as if they are going to get anything of real value back in a trade, especially now when the Browns would be selling low. Why not wait until they how training camp – both their own and for other teams – before they make any kind of decision? While we think McCoy would be a better choice for the Browns, we get the feeling they will go with Wallace, who has spent more time in the West Coast Offense than McCoy. If Weeded runs into trouble and needs someone to talk to, it’s easier to see Wallace in that role than McCoy. It certainly was a lot harder than it needed to be, but Kent State sent No. 1 Florida home on Monday, beating the Gators, 5-4 to stay alive in the College World Series. After loading the bases by walking two batters and hitting another one in the top of the ninth, with one out reliever Jason Pierce got Casey Turgeon out on a checked-swing strikeout and Justin Shafer on a flyout to seal the deal. The Golden Flashes scored four unearned runs and another on a wild pitch to earn the win. Never doubted them for a moment. Spain and Italy are through to the knockout round after picking up wins on Monday in the final matches of Group C.
Things were tight for Spain until Jesus Navas scored in the 87th minute to secure the 1-0 victory. “It was a very difficult victory,” Spain coach Vicente Del Bosque told The Daily Mail. “We did not have much strength to go forward. We didn’t have the clarity and control we usually have, therefore we lost our intensity. It was odd seeing Spain in blue (much like it was strange seeing England in the same color over the weekend) but apparently Spain didn’t want to run the risk of wearing their yellow jerseys, which are considered unlucky because of a traditional Spanish superstition surrounding the color that is believed to have started because French playwright Moliere was wearing yellow when he collapsed on stage performing Le Malade Imaginaire in 1673. He later died at his home. And to think, Browns fans have only been stressing over the Brown jerseys for a year.